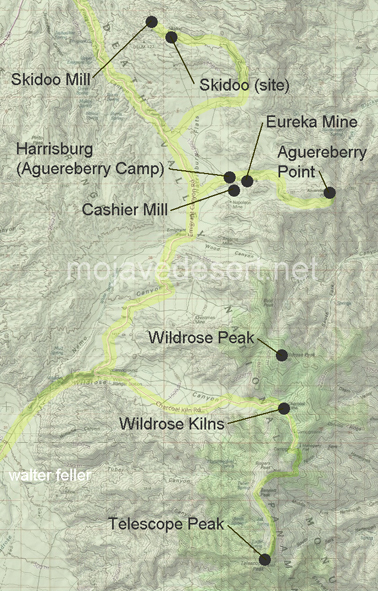 Road access: Graded gravel to Charcoal Kilns; final 1.5 miles to Mahogany Flat are rough, gravel road OK for 2WD high-clearance vehicles; may require 4WD in winter & spring. Cautions: No water available at the campground or along trail; may be snow covered and icy from December to May; dogs and horses are not allowed. From the trailhead at 8,133 feet elevation, the trail climbs steadily as it winds around the east slope of Roger's Peak through woodlands of mountain mahogany, pinyon pine and juniper. At Arcane Meadows the trees become scattered and the trail levels out as it meanders across a broad open saddle leading to the final ascent of Telescope Peak. Gnarled ancient bristlecone pines are mixed among stands of limber pine where the trail switchbacks up the east face of the peak. The summit is reached after a short scramble along a narrow ridge. 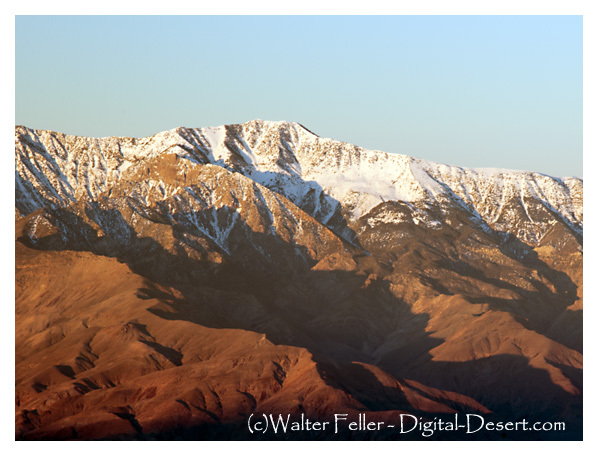 Telescope Peak earned its name from the vast area visible from the summit on a clear day. Snow and ice usually make this trail too hazardous for all but well-equipped climbers during winter and spring. For safety it may be necessary to avoid the final switchbacks and stay on the ridge. Winter climbers should be experienced and equipped with ice axe, crampons, winter clothing, boots, and ropes. Be prepared for subfreezing temperatures and sudden weather changes.